Plot: Without giving anything away, the film is about a young American and his friend on a trek through Europe. Along the way they are attacked by a werewolf. One is killed, one survives only to find he's slowly turning into a werewolf himself. The film follows his descent into terror and paranoia in the English countryside and downtown London. Why you should watch it: With the preponderance of supernatural films lately, the genre has been watered down by safe characters and poor script writing. However, this classic from 1981 reminds us that the supernatural is neither cuddly nor cute, and it should be something to be treated with caution. Werewolves are, at their roots, horrifically frightening and vicious creatures. The dialogue is quick and smart, and the actors play their roles to perfection. Naughton is great as David, a young man finally coming to grips with what he's slowly becoming, while losing his sanity along the way. 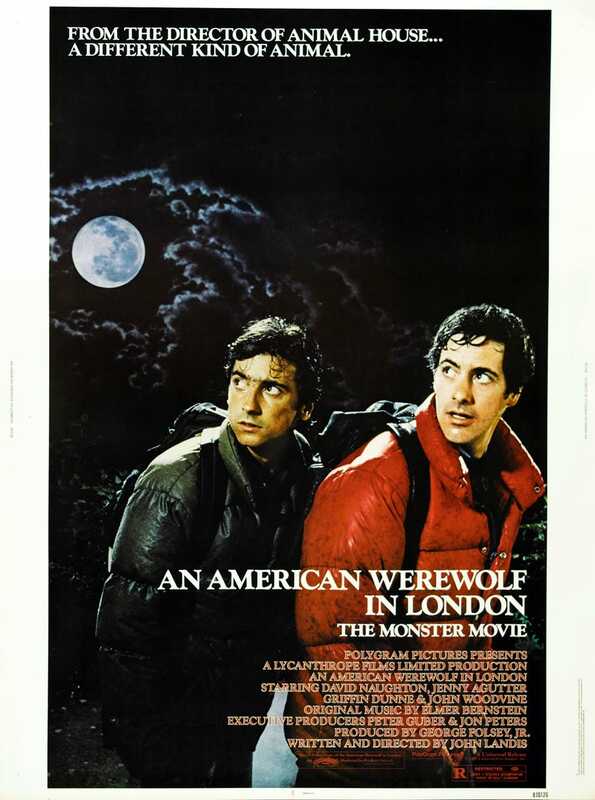 Griffin Dunne steals the film as the best friend who comes back to warn David of his impending demise. As the film progresses, David turns a few times, leaving catastrophic violence in his wake. He is comforted by the nurse who at first cares for him, but then takes him in to her home. The scene where David "meets" all his victims is alone worth the price of admission. The direction, handled deftly by John Landis, meets the tone of the film, yet lends itself to moments of dark humor. The movie isn't jokey, but Landis injects just the right amount of gallows humor to keep the film from being a total bloodbath. As a director who was, at the time, known more for comedies, time has proven he was the right director for this particular movie. It helped that he had Rick Baker as his makeup man though. Baker's werewolf is, I feel, the quintessential cinematic version of what a werewolf should be. Every idiot that makes some sort of Twilight-esque movie should be forced to watch this film repeatedly in order to make sure he gets it right. Baker won an Oscar in 1981 for his efforts on this film, and deservedly so. His werewolf is frightening, and the scenes where David turned were unlike anything Hollywood had ever done before. The only trailer I could find is this one, but I hope it conveys the tone and mood of the film enough to encourage you to watch it. Do yourself a favor - queue this up, turn down the lights, and sit back and enjoy. You will realize what a true werewolf movie should be.